Sweet taste has powerful hedonic appeal among people of all ages, particularly children. Described herein is a reliable and valid method that can be used to determine the level of sweetness most preferred, making it a valuable psychophysical tool for scientists. Mennella, J. A., Bobowski, N. K. Psychophysical Tracking Method to Measure Taste Preferences in Children and Adults. J. Vis. Exp. (113), e54163, doi:10.3791/54163 (2016). The Monell two-series, forced-choice, paired-comparison tracking method provides a reliable measure of sweet taste preferences from childhood to adulthood. The method, which is identical for children, adolescents, and adults, is of short duration (< 15 min), does not rely on sustained attention or place demands on memory (which would yield spurious age differences), and minimizes the impact of language development, making this method amenable to the cognitive limitations of pediatric populations. In this whole-mouth tasting method, subjects are asked to taste (without swallowing) pairs of solutions of different sucrose concentrations and to point to the solution they prefer. Each subsequent pair contains the participant's preceding preferred concentration and an adjacent stimulus concentration. The procedure continues until the subject chooses either a given concentration of sucrose when paired with both a higher and a lower concentration, or the highest or lowest concentration two consecutive times. Subjects are prevented from reaching response criteria on the basis of first or second position bias by the two-series design of the method, which counterbalances the order of solution presentation within each pair between the series (the weaker concentration is presented first in Series 1, second in Series 2). The geometric mean of the two sucrose concentrations chosen in Series 1 and 2 is an estimate of the participant's most preferred level of sucrose. Sucrose preference as determined with this laboratory-based measure has been shown to be associated with preference for sugars in foods and beverages and with taste receptor genotype, family history of alcoholism, and race/ethnicity, as well as depressive symptomatology among pediatric populations. The method has real-world relevance and has been applied to determine most preferred level of other tastes (e.g., salt), making it a valuable psychophysical tool. The sense of taste controls one of the most important decisions we make: whether to eat something or not. From birth, humans show a strong liking for sweet taste1-it attracts the newborn to mother's milk and signals the presence of calories from nutrient-dense foods (e.g., fruits)2. Although this inborn trait confers an advantage for survival in an environment of scarcity, an individual's liking for sweet coupled with a food environment that supplies sugar in abundance has resulted in overconsumption of sweetened foods3. Current estimates suggest that 13.1-17.5% of children's and 11.2-14.5% of adults' total energy intake is derived from added sugars4; in both cases, levels are well above national and international dietary recommendations5,6. Despite the importance of taste in determining food choice and intake, and the association between diet and health, methodologies to accurately assess taste hedonics are limited, particularly for use with pediatric populations7-9. One of the methods most commonly used with children is hedonic category scaling10-12, which involves choosing a response from a series of discrete alternatives that signify increasing preference. These alternatives are often depicted with smiley faces10 or with verbal descriptors ranging from "super bad" to "super good"13, and are useful for determining whether a child likes the taste of a stimulus or not. Ranking procedures, in which a subject is required to order several choices by how well they are liked (e.g., from most to least liked), are also frequently used and are intended to convey information on relative liking of stimuli13,14. Although both methods provide valuable information on two separate dimensions of hedonic response, neither directly assesses taste preference, specifically the concentration of a stimulus perceived to be of optimal palatability. The method described herein was specifically developed to determine an individual's most preferred level of a tastant through direct comparisons of pairs of stimuli of varying concentrations, bypassing the need to infer preference from ratings of stimuli evaluated individually in a sequential monadic manner, as is often practiced in psychophysical testing. Here, we detail the protocol for the Monell two-series, forced-choice, paired-comparison tracking technique for determining sweet taste preferences15,16. The method was first developed for measuring salt preference17,18. It was later modified for measuring sucrose preference19,20, tested for measures of both reliability and validity15, and selected for the National Institutes of Health Toolbox Assessment for Neurological and Behavioral Function as the method of choice to assess children's sweet taste preference for clinical, epidemiological, and longitudinal studies16. The method, which typically takes no more than 15 min to complete, has been used to measure the most preferred level of sucrose among hundreds of children, adolescents, and adults15,19-25. In a study of 949 subjects, only 5% of the 356 children tested were unable to complete both series of the sweet preference test due to unfocused behavior or failure to understand the task15, highlighting the appropriateness of the method for pediatric populations. In brief, following a 1-hr fast, consenting subjects are presented with pairs of sucrose solutions of varying concentrations (3-36%) in a two-series test, with the lower concentration presented in the first position in each pair in the first series. Subjects taste the pair of solutions and are instructed to point to the solution they prefer. Subsequent pairs of solutions are presented based on the subject's preferred concentration in the previous pair. The test continues until the subject selects the same sucrose concentration twice relative to both a lower and a higher concentration, or until the subject selects the lowest (3%) or highest (36%) concentration twice consecutively. The protocol is then repeated in reverse order, with higher concentrations presented in the first position in each pair. On average, the method requires 7 presentations of solution pairs16. The described method is particularly effective for use with children because it accounts for several methodological concerns often overlooked in other psychophysical tests: (1) the method is short in duration and does not require a sustained attention span; (2) the two-series protocol in which solution concentrations are counterbalanced between the series controls for position bias; (3) the forced-choice procedure circumvents children's inclination to answer questions in the affirmative26; (4) use of a whole-mouth instead of a regional-tasting protocol accounts for age-related differences in the growth and size of the tongue27; and (5) instructing children to point to their most preferred concentration of sucrose addresses potential cognitive limitations by eliminating the need for a verbal response19. Since its development, the Monell two-series, forced-choice, paired-comparison tracking technique has revealed consistent differences in sweet taste preference as a function of age15,28 , race/ethnicity15,23, taste receptor genotype19,24, family history of alcoholism20,25, and depressive symptomatology among pediatric populations20. In addition, sweet taste preference as measured by this method is associated with preference for sugar in foods and beverages15,19,21,22, providing evidence of criterion-related validity and a measure of insight into the association between an individual's sweet preference and their dietary sugar intake. This method has been approved by the Office of Regulatory Affairs at the University of Pennsylvania. For the research studies described herein, informed consent was obtained from each adult and informed assent from each child seven years of age or older. Conduct the preference test in a comfortable, private room that ideally has a sink for subjects to expectorate solutions during testing. If a sink is not available, give subjects a cup into which to expectorate. Obtain 1-L volumetric flasks, 1-L amber glass bottles, and 100 ml amber glass bottles for the preparation, storage, and dispensing of solutions. For testing, obtain the following materials: 30 ml disposable medicine cups for solutions; drinking cups containing water for rinsing in between trials; a stopwatch to monitor inter-pair and inter-series intervals; distilled water for solution preparation and for rinsing; a cup for expectoration (if the testing room does not contain a sink); a sheet of paper labeled with the numbers 1 and 2 representing the order of tasting; and a tracking grid (Figure 1) for recording data. Figure 1. Tracking grids for recording sucrose preference. The solution presented first is underlined in each grid. Please click here to view a larger version of this figure. Clean and sterilize all bottles in an autoclave, and label each with the date and the stimulus label: A, B, C, D, E. Weigh the appropriate amount of sucrose to make solutions A through E (Table 1). Making one solution at a time, place the appropriate grams of sucrose (Table 1) in 1 L volumetric flask and fill to the line on the flask with distilled water. Mix to dissolve the sucrose. Once sucrose is dissolved, transfer the solution to the appropriately labeled 1 L amber glass bottle. Store the solution-containing bottles in the refrigerator (4 °C) for a maximum of one week. Repeat step 2.3 to make the remaining four solutions. Solutions will be enough to test approximately 25-30 subjects. 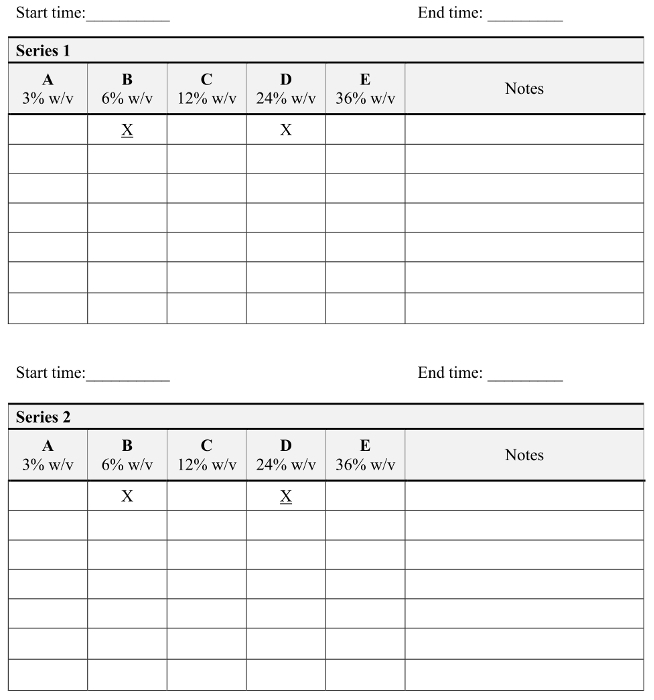 Construct tracking grid to record subject data, using template found in Figure 1. 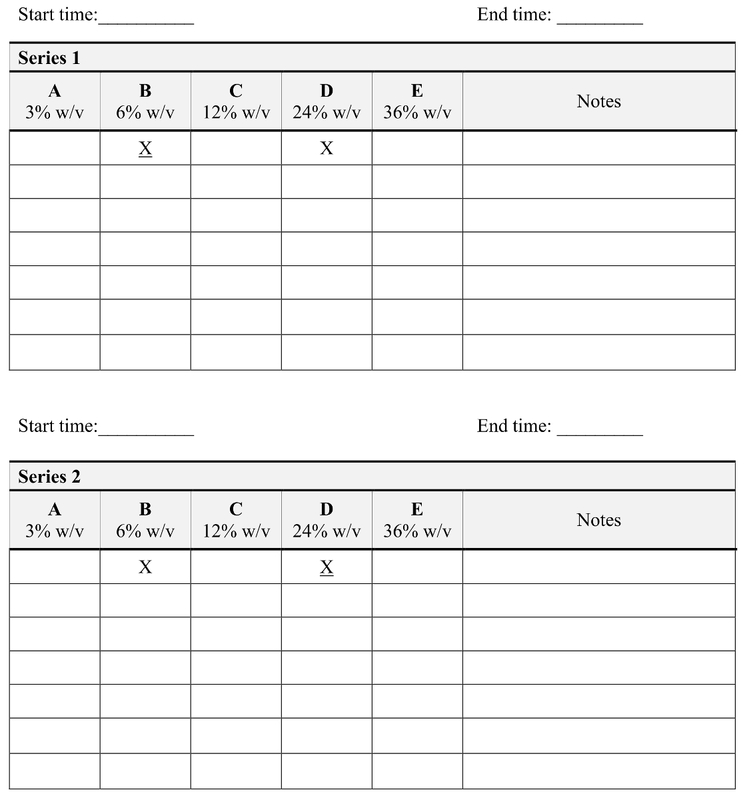 Label each grid with the Series number (1 or 2) and the concentrations of the sucrose solutions, and include space to record the start and end times of each series. Include a column on each grid to record notes as necessary during the test. Instruct adults to abstain from eating or drinking and instruct parents to not give child participants anything to eat or drink for at least 1 hr before testing. Two hr before testing, remove solutions from the refrigerator, transfer approximately 100 ml of each to the appropriately labeled 100 ml amber glass bottles, and allow the solutions to equilibrate to RT. Seat the subject at a table in front of the sheet of paper labeled with the numbers 1 and 2, and allow the subject to acclimate to the testing room and the tester for at least 10 min. Note: The preference test is a two-series, forced-choice, paired comparison tracking technique in which subjects are asked to taste (without swallowing) pairs of solutions of different concentrations and to point to the solution they prefer. Below are the introductory verbal instructions given to pediatric and adult subjects at the time of testing, followed by investigator instructions on how to conduct the preference test. Show the cups to the subject and say: "We're going to play a game with things to taste. Here are two cups. You will taste what's inside the first cup, swish it around your mouth, but don't swallow, and I will tell you when to spit it out in the sink (or cup). You will then rinse your mouth with water, and then taste what's inside the second cup. I will tell you when to spit it out. Then I want you to point to which one you like better-the first one or the second one. You will then rinse your mouth two times with water, and we will do this again. There is no right or wrong answer; we want to know which one you like better." Show the cups to the subject and say: "We're going to give you solutions to taste. Here are two cups. You will taste what's inside the first cup, swish it around your mouth, but don't swallow, and I will tell you when to spit it out in the sink (or cup). You will then rinse your mouth with water, and then taste what's inside the second cup. I will tell you when to spit it out. Then I want you to point to which one you like better-the first one or the second one. You will then rinse your mouth two times with water, and we will do this again. There are no right or wrong answers; we want to know which one you like better." For Series 1, begin by placing two cups, respectively containing 5 ml of solution B and 5 ml of solution D on a sheet of paper labeled with the numbers 1 and 2 in front of the subject: Place solution B on number 1 to be tasted first. Place solution D on number 2 and have the participant taste second. In Series 1, always place the weaker (lower) concentration solution of the pair in the number 1 position. Using the grid in Figure 1, underline the concentration that is presented first (solution B). Instruct the subject to taste the solution in position 1 by swishing; after 5 sec instruct the subject to expectorate, to rinse his or her mouth with water, and to expectorate again. Instruct the subject to taste the solution in position 2 by swishing, and to expectorate after 5 sec. Ask the subject to point to the solution the subject likes better. If the subject says they like both, instruct the subject to again point to the one they like better. Circle the X on the grid (Figure 1) that corresponds to the subject's preferred concentration. Instruct the subject to rinse his or her mouth twice with water and to expectorate. Use the timer to wait 1 min before presenting the next pair of solutions. For the second comparison of solutions in Series 1, pair the preferred concentration from the first comparison with the lower adjacent concentration. For example, if the subject prefers solution D to solution B in the first pair, then present the second pair consisting of solutions C and D. Place solution C (the lower concentration) in position 1 and solution D in position 2. Indicate which solutions are being presented by marking X's on the grid and underline the X that corresponds to the solution presented in position 1 (in this case Solution C). Repeat this process until the subject chooses the same concentration when presented with both a lower and higher adjacent concentration (e.g., if the subject chooses C when paired both with B and with D), or when the subject chooses either the lowest (A) or the highest concentration (E) twice consecutively. Record each subject's preferred concentration from Series 1 on the grid, and wait 3 min before beginning Series 2. For Series 2, pour 5 ml of each of solutions B and D into disposable cups, and place solution D on number 1 and solution B on number 2 in front of the subject. In Series 2, the stronger (higher) concentration solution of the pair is always placed in the number 1 position. Using the grid, underline the concentration that is presented first (D). Instruct the subject to taste and expectorate the solutions following the protocol used for Series 1 as outlined in steps 4.2.2-4.2.8. For the second comparison of solutions in Series 2, pair the preferred concentration from the first comparison with the higher adjacent concentration. For example, if the subject prefers solution D to solution B in the first pair, present solutions E and D in the second pair, placing solution E (the higher concentration) in position 1. Repeat this process until the subject chooses the same concentration when presented with both a lower and higher adjacent concentration, or when the subject chooses either the lowest or the highest concentration twice consecutively. Record the subject's preferred concentration from Series 2 by circling it on the grid. Figure 2 contains the tracking grid results from one representative subject. This subject's most preferred level of sucrose, 4.2% w/v, was determined by calculating the geometric mean of the sucrose concentrations chosen in Series 1 (6% w/v) and Series 2 (3% w/v). In cases where the subject only completes one of the series, the geometric mean obviously cannot be calculated. Further analysis can focus on data obtained from Series 1 separately from Series 215. 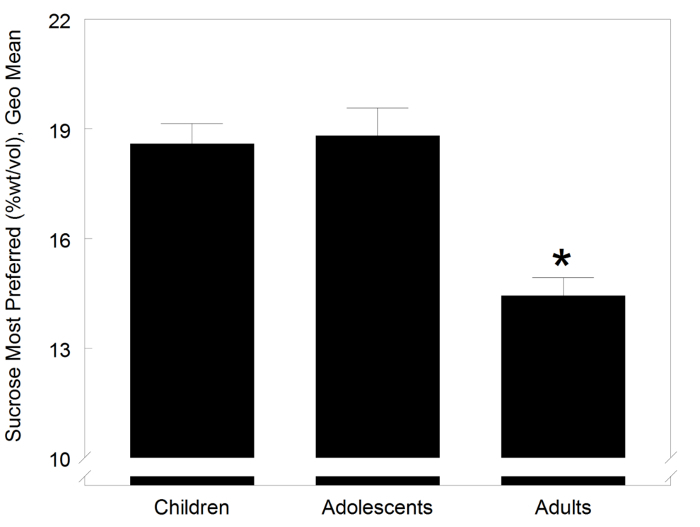 Figure 3 summarizes data collected from 930 individuals ranging in age from 5 to 55 years15.Children and adolescents prefer more concentrated sweetness (~19% wt/vol sucrose solution) than adults (~14% wt/vol). Where the adults' most preferred level of sucrose is similar to the sugar content of a typical soda (~11% wt/vol or 39 g/355 ml), one would have to add 28 g (seven teaspoons) to a standard 355 ml can of soda to approximate children's most preferred level. Figure 2. A subject performing the sucrose preference test and a tracking grid containing representative data from one subject. (A) A pair of sucrose solutions is placed on the table in front of the subject in the order to be tasted. The subject is asked to taste the solution in position 1 for 5 sec, to expectorate, to rinse her mouth with water, and to repeat for the solution in position 2. After tasting both solutions, the subject is asked to point to the solution that she likes better, and to rinse her mouth twice with water. (B) The first solution of the pair tasted by the subject is underlined, and the subject's choice is circled. In Series 1, testing ended when the subject chose solution B when it was paired with both a higher and lower concentration of sucrose. In Series 2, testing ended when the subject chose solution A (the lowest concentration solution) twice consecutively. (C) Determination of the subject's preferred level of sucrose is estimated by calculating the geometric mean of the final concentration chosen in each series. The figure has been modified from Mennella, J. A., Lukasewycz, L. D., Griffith, J. W., Beauchamp, G. K. Evaluation of the Monell forced-choice, paired-comparison tracking procedure for determining sweet taste preferences across the lifespan. Image has been reproduced with permission15. Please click here to view a larger version of this figure. Figure 3. The most preferred level of sucrose (% wt/vol). These data were obtained from calculating the geometric mean (Geo Mean) from both Series 1 and Series 2 among children (5-10 years, N=338), adolescents (10-20 years, N=168), and adults (20-55 years, N=424). Error bars represent standard errors of the means. *Significantly different from children and adolescent groups. Data from15. Please click here to view a larger version of this figure. Table 1. Concentrations of sucrose solutions for the preference test. The Monell two-series, forced-choice, paired-comparison tracking technique detailed here has been consistently used to determine sweet taste preference among nearly 2,000 racially and ethnically diverse subjects as young as 5 years of age. The preference test, which for children is embedded within the context of a game, is sensitive to the cognitive limitations of children and is a much-needed method to fill the gap in age-appropriate psychophysical research methods for pediatric populations. If completed as described, with special attention paid to enforcing the 5-sec tasting protocol, subjects thoroughly rinsing their mouths with water both within and between solution pairs, and strict monitoring of inter-pair and inter-series intervals, the method is safe, reliable, and quick; results are easily interpreted and provide insight into an important dimension of sweet taste perception. In addition, because children are not required to verbalize their response, instructions for the method could easily be translated into other languages to allow for cross-cultural studies. Findings from use of the described method have contributed extensively to the current understanding of the relationship between sweet preference and a number of genetic and environmental factors. Data collected over nearly a decade from separate groups of subjects have consistently revealed that, as a group, children most prefer a higher concentration of sucrose than do adults, an age-related difference that has been remarkably stable over the past decade28. Use of the method has also revealed sources of individual differences in sweet taste preference among both children and adults, including variation in taste receptor genes19,23, race/ethnicity15,23, family history of alcoholism20,25, and depressive symptomatology20. The method has real-world relevance and can be used with children five years of age and perhaps even younger18; however, like any other psychophysical method, there will likely be limitations in its use with younger children. Because the method does not require verbal responses, the instructions can easily be translated to other languages, making it a valuable psychophysical tool for scientists worldwide. The method has successfully been used to determine children's and adults' most preferred level of salt17,18,21, and has the potential to be adapted to determine preferences for stimuli of varying hedonic qualities, adding to our growing understanding of taste response from childhood to adulthood. Finally, future applications could use the method to determine whether changes in the intake of nutritive or non-nutritive sugars might shift the individual's most preferred level of sucrose, as has been demonstrated with alterations in most preferred level of salt following changes in dietary salt intake29,30. This work was supported by the National Institute of Deafness and Other Communication Disorders (NIDCD), National Institutes of Health (NIH) [grant number R01 DC011287] and NIH postdoctoral training grant (T32-DC00014). The content is solely the responsibility of the authors and does not necessarily represent the official views of NIDCD or NIH. The funding agencies had no role in the design and conduct of the study; in the collection, analysis, and interpretation of the data; or in the preparation or contents of the manuscript. Desor, J. A., Maller, O., Turner, R. E. Preference for sweet in humans: infants, children and adults. In Taste and development: the genesis of sweet preference. Weiffenbach, J. M. US Government Printing Office. 161-172 (1977). Mennella, J. A. Taste and smell. Pediatric Neurology: Principles and Practice. Swaiman, K. F., Ashwall, S., Ferriero, D. CV Mosby Company. Ch. 9 135-149 (2006). Birch, L. L., Anzman-Frasca, S. Learning to prefer the familiar in obesogenic environments. Nestle Nutr Workshop Ser Pediatr Program. 68, 187-196 (2011). Drewnowski, A., Rehm, C. D. Consumption of added sugars among US children and adults by food purchase location and food source. Am J Clin Nutr. 100, (3), 901-907 (2014). Department of Agriculture and U.S. Department of Health and Human Services. Dietary Guidelines for Americans, 2010. 7th edn. U.S. Government Printing Office. (2010). Sugars intake for adults and children. World Health Organization. Available from: http://www.who.int/nutrition/publications/guidelines/sugars_intake/en/ (2015). Chambers, E. Commentary: conducting sensory research in children. J Sens Stud. 20, (1), 90-92 (2005). Laing, D. G., et al. Tests for screening olfactory and gustatory function in school-age children. Otolaryngol Head Neck Surg. 139, (1), 74-82 (2008). Mennella, J. A., Beauchamp, G. K. Optimizing oral medications for children. Clin Ther. 30, (11), 2120-2132 (2008). Chen, A. W., Resurreccion, A. V. Age appropriate hedonic scales to measure food preferences of young children. J Sens Stud. 11, (2), 141-163 (1996). Li, X. E., Lopetcharat, K., Drake, M. A. Parents' and children's acceptance of skim chocolate milks sweetened by monk fruit and stevia leaf extracts. J Food Sci. 80, (5), 1083-1092 (2015). Guinard, J. X. Sensory and consumer testing with children. Trends Food Sci Technol. 11, (8), 273-283 (2000). Popper, R., Kroll, J. J. Conducting sensory research with children. J Sens Stud. 20, (1), 75-87 (2005). Leon, F., Couronne, T., Marcuz, M. C., Koster, E. P. Measuring food liking in children: a comparison on non verbal methods. Food Qual Prefer. 10, (2), 93-100 (1999). Mennella, J. A., Lukasewycz, L. D., Griffith, J. W., Beauchamp, G. K. Evaluation of the Monell forced-choice, paired-comparison tracking procedure for determining sweet taste preferences across the lifespan. Chem Senses. 36, (4), 345-355 (2011). Coldwell, S. E., et al. Gustation assessment using the NIH Toolbox. Neurology. 80, (11), Suppl 3 20-24 (2013). Beauchamp, G. K., Cowart, B. J. Preference for high salt concentrations among children. Dev Psychol. 26, (4), 539-545 (1990). Cowart, B. J., Beauchamp, G. K. Early development of taste perception. Psychological Basis of Sensory Evaluation. McBride, R., MacFie, H. Elsevier. 1-17 (1990). Mennella, J. A., Pepino, M. Y., Reed, D. R. Genetic and environmental determinants of bitter perception and sweet preferences. Pediatrics. 115, (2), 216-222 (2005). Mennella, J. A., Pepino, M. Y., Lehmann-Castor, S. M., Yourshaw, L. M. Sweet preferences and analgesia during childhood: effects of family history of alcoholism and depression. Addiction. 105, (4), 666-675 (2010). Mennella, J. A., Finkbeiner, S., Lipchock, S. V., Hwang, L. D., Reed, D. R. Preferences for salty and sweet tastes are elevated and related to each other during childhood. PLoS One. 9, (3), e92201 (2014). Kim, J. Y., Prescott, J., Kim, K. O. Patterns of sweet liking in sucrose solutions and beverages. Food Qual Prefer. 36, 96-103 (2014). Pepino, M. Y., Mennella, J. A. Factors contributing to individual differences in sucrose preference. Chem Senses. 30, Suppl 1 319-320 (2005). Mennella, J. A., Finkbeiner, S., Reed, D. R. The proof is in the pudding: children prefer lower fat but higher sugar than do mothers. Int J Obes (Lond). 36, (10), 1285-1291 (2012). Pepino, M. Y., Mennella, J. A. Effects of cigarette smoking and family history of alcoholism on sweet taste perception and food cravings in women. Alcohol Clin Exp Res. 31, (11), 1891-1899 (2007). Schmidt, H. J., Beauchamp, G. K. Adult-like odor preferences and aversions in three-year-old children. Child Dev. 59, (4), 1136-1143 (1988). Temple, E. C., Hutchinson, I., Laing, D. G., Jinks, A. L. Taste development: differential growth rates of tongue regions in humans. Brain Res Dev Brain Res. 135, (1-2), 65-70 (2002). Mennella, J. A., Bobowski, N. K. The sweetness and bitterness of childhood: Insights from basic research on taste preferences. Physiol Behav. (2015). Bertino, M., Beauchamp, G. K., Engelman, K. Long-term reduction in dietary sodium alters the taste of salt. Am J Clin Nutr. 36, (6), 1134-1144 (1982). Bertino, M., Beauchamp, G. K., Engelman, K. Increasing dietary salt alters salt taste preference. Physiol Behav. 38, (2), 203-213 (1986).